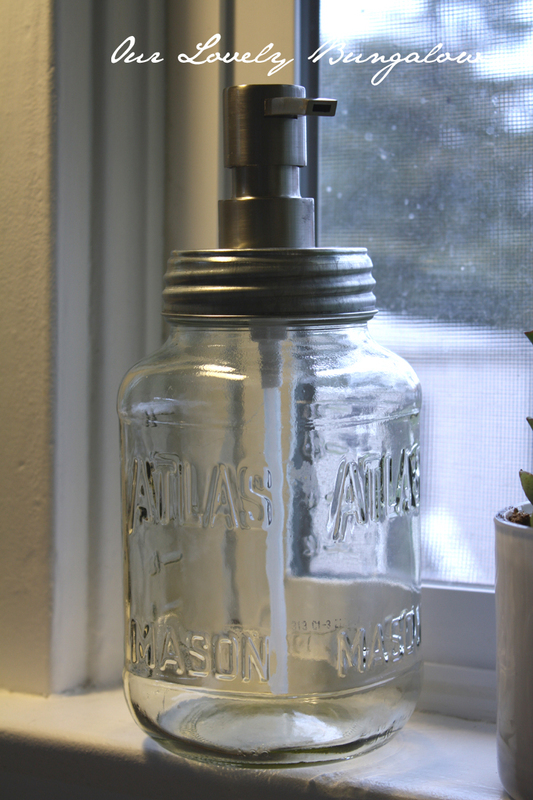 I have been loving our mason jar soap dispensers over the last few months, but with use I've noticed a few things that could use a little re-working. 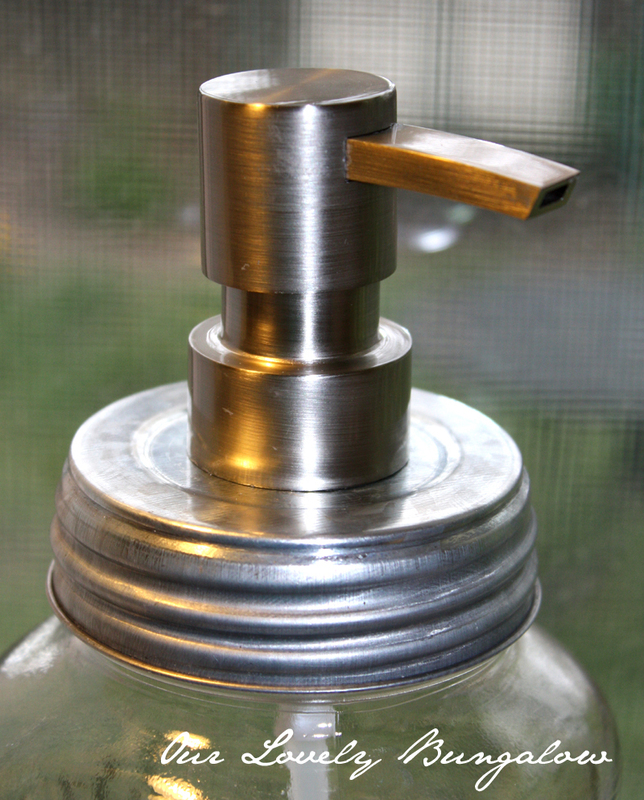 The pump of one of the dispensers became loose so a stronger method of attaching the lid to the pump was needed. Also, where I made the hole in the lid to insert the pump rusted. So I searched online and with a few helpful hints from you guys as comments on the last post I decided to try new pumps and a new method to attach the pumps to the lids. I bought some nice metal pumps online in a satin nickel finish and some galvanized lids that match pretty closely. I also bought a metal punch set that Brian used to "punch" round holes in the lids to fit the pump. Then he inserted the pump into the hole and used epoxy to attach the pump to a rubber stopper added on the underside of the lid to hold it in place. 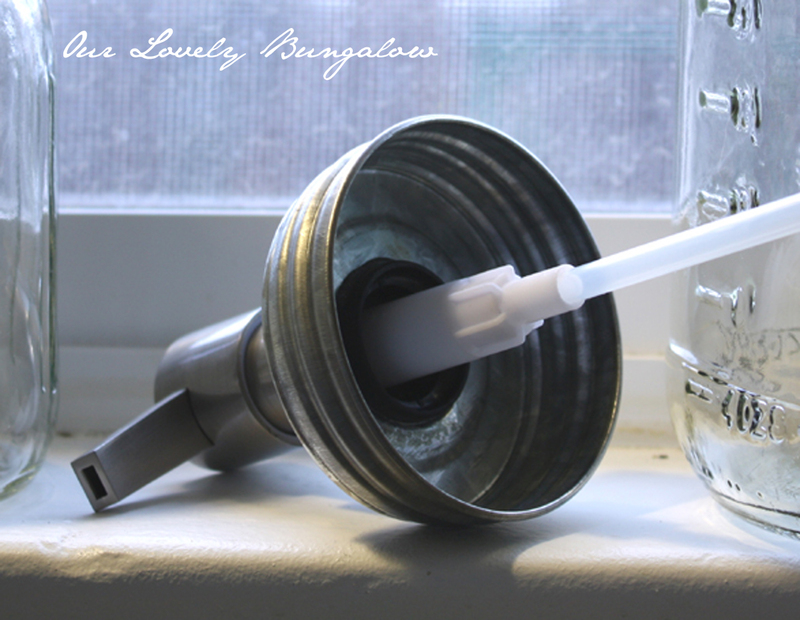 Then all that was left to do was screw the lid onto the mason jar. As for painting the jars, the jars I painted last time around have held up pretty well. There are a few tiny spots where the paint scraped off but nothing very noticeable. If you are relatively careful with the jars (no scouring pads for cleaning) then I think the paint will hold up well. An advantage with the clear jars is that you can add any color of soap to match your decor or to add a bit of color. Also, there are beautiful blue glass jars, like the "Ball" jar below, but they are harder to come by. I found two blue jars at an antique store a while back, but for clear jars, thrift stores usually have a few in stock for a lot cheaper, or you can use any old jar you have on hand! Where did you find the jar lids? All the ones I've found are the 2-part lids. This is a great idea! Thanks for the tutorial! 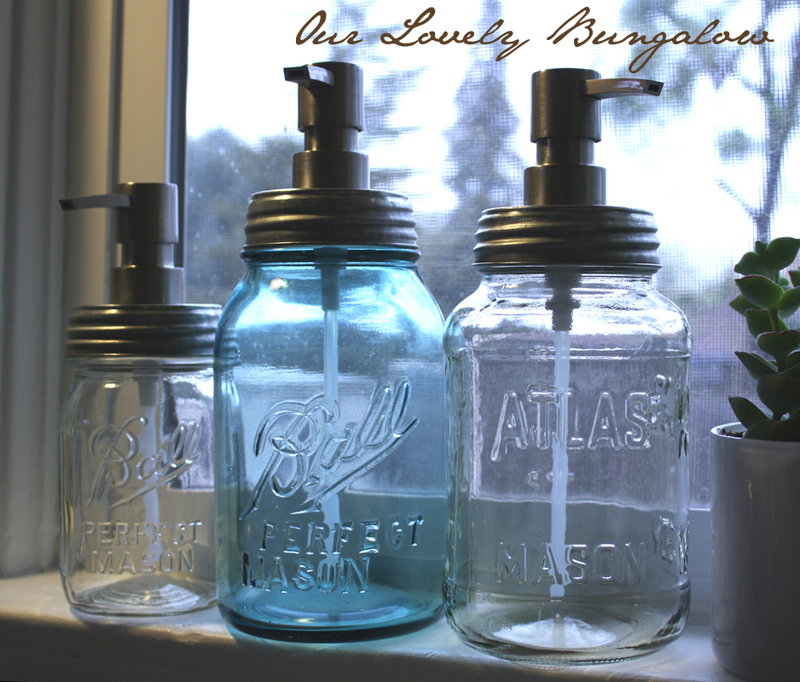 I have a lot of jars and love the idea of using them as soap dispensers. I found the lids at Factory Direct Craft online.